Sanshui City of south China's Guangdong Province has built a lotus flower world which has collected most of the already identified varieties of lotus flowers on earth. 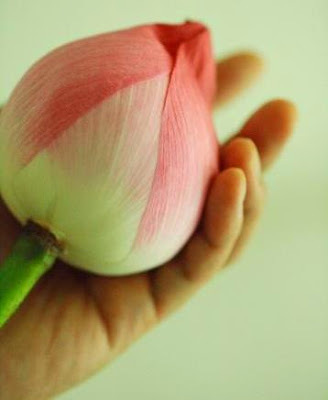 Some 300 varieties of lotus flowers are available at the flower world, which covers an area of about 66.7 hectares. And more than 40 hectares of the flower world's total area is used to cultivate lotus flowers of red, yellow, white, purple and blue colors, florists said. Construction of the special flower world started in March 1999 and it cost 100 million yuan (about 12.1 million U.S. dollars). It consists of six functional zones, such as ornamental flowers zone, scientific research zone, flower cultivating zone and a central zone.. 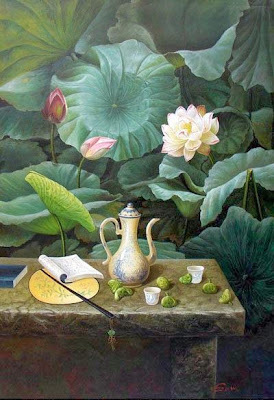 In Chinese culture, lotus flowers are also in association with purity and loftiness. They have been valued by the Chinese as the beautiful flower emerging unstained from the filth. 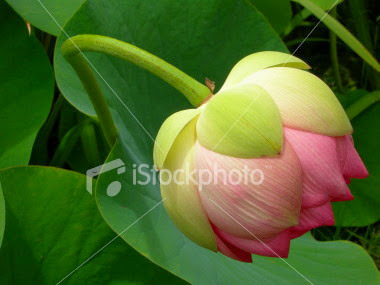 According to the local sources, the lotus flower world will open to the public on July 8. I am learning lot's of lesson's abt life... women's are suffering lot after marriage...all thru maamiar..why they are like this ?i think if they have a girl child, they don't torture the marumaghal...i am seeing this in my sister's family...first my twin sister...now my elder sister is suffering...even she is in nuclear family ...maamiar is giving torture thru phone. She said 'maamiar na, thittuvaanga adhai vangithaan agha vendum'. 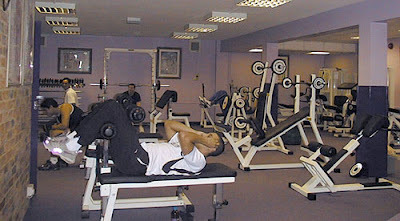 when i hear all these stuff's, i hate guy's... why they are like boom boom maadu ? whatever his mother say's accepting not considering his wife..
Once doctor said to my mom that 'this maamiar kodumai is a fate to a girl which is not written'. His daughter also a doctor... she is in united-states, she is getting torture by her mother-in-law thru phone from india. I am learning lot's of lesson's abt life... women's are suffering lot after marriage...all thru maamiar..why they are like this ?i think if they have a girl child, they don't torture the marumaghal...i am seeing this in my sister's family...first my twin sister...now my elder sister is suffering...even she is in nuclear family ...maamiar is giving torture from phone. பெண்ணின் மனம் மண் பொம்மையாக இருக்க கூடாது, கல்லில் மறைந்த சிற்பம் போல் இருக்க வேண்டும். களிமண்ணில் பொம்மை செய்வது எளிது, அதற்கு வர்ணம் பூசினாள்(வேசம்) அழகாக தோன்றும், ஆனால் அது சில நாட்களில் உடைந்து விடும் .. கல்லில் மறைந்த சிற்பத்தை வடிப்பது கடினம், அதற்கு பாசத்தால் அபிஷேகம் செய்தால் அதன் அழகு மெருகேறும், என்றும் பொலிவுடன் நிலைத்து நிற்கும்..
பெண்ணின் மனம் கல்லில் மறைந்த சிற்பம் போன்றது அதனை ஆண் மகன் பாசம் என்னும் உழியால் பொறுமையாக செதுக்கினாள் தான் அழகான சிற்பம் தோன்றும்(பெண்ணின் மனம்).. அது பூ போன்று மென்மையானது... அந்த இதய மலரை அவன் ரசிக்க வேண்டும் .. ஆண் மகன் இங்கு சிலையை செதுக்க கடினம் என்கிறான்.. ஆனால் பெண் தான் உழியின் வலியை தாங்குகிறாள்.. அவள் தான் இங்கு சிறந்தவள் ஆணின் பொறுமை தான் கல்லில் புதைந்த சிற்பத்தை கொண்டு வர முடியும். I am writing this after hearing a story of a friend's sister.....This is the reason some love suceed's after marriage and many fails. 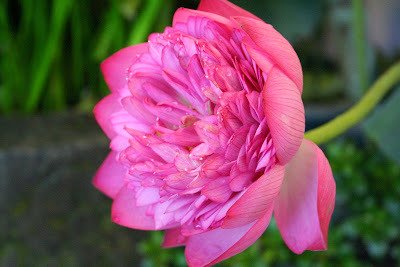 Saturday slept well... Sunday At 11.0 A.M, I went to market to buy lotus flowers...since the sack of lotus came late,i have waited there for nearly 1/2 hr for lotus... Only pink lotus flower's came,i bought those flowers. 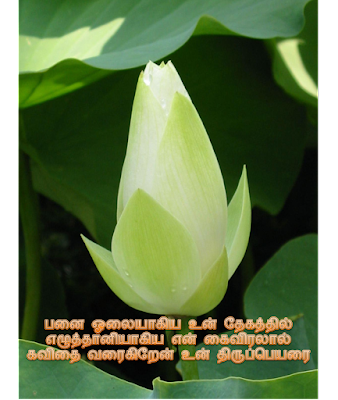 It looks pretty to see siva decorated with lotus flowers. My sister also came temple to see lord shivdecorated with lotus flowers..since she like's lord shiva very much..
.....time went fast.... At 8.00 P.M started back to chennai by travels....today morning reached here at 8.00 A.M.
yesterday we(myself & tsunami) talked abt life...she told abt her sister's life..that time she tells that 'pennin manam kallil maraindha sirpam pondrathu' adhai rasika vendum endraal..I also accepts her words..
தாமரையே நீ சிற்பமாக தான் இருக்கிறாய், உனக்கு வலிக்கும் என்று கவலைபடுகிறேன்.. Yesterday i have paid the fees to write 703 on feb 14th after long struggle....Hope i shouldn't postpone the exam.